Volume 1 provides a broad overview of the chemistry of the solar system. 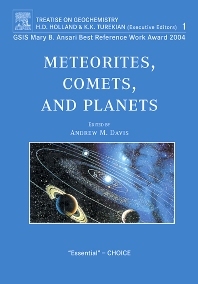 It includes chapters on the origin of the elements and solar system abundances, the solar nebula and planet formation, meteorite classification, the major types of meteorites, important processes in early solar system history, geochemistry of the terrestrial planets, the giant planets and their satellite, comets, and the formation and early differentiation of the Earth. This volume is intended to be the first reference work one would consult to learn about the chemistry of the solar system. Executive Editors’ Foreword. Contributors to Volume 1. Volume Editor’s Introduction. Origin of the Elements (J.W. Truran Jr., A. Heger). Solar System Abundances of the Elements (H. Palme, A. Jones). The Solar Nebula (A.P. Boss). Classification of Meteorites (A.N. Krot et al). Oxygen Isotopes in Meteorites (R.N. Clayton). Chondrites and their Components (E.R.D. Scott, A.N. Krot). Calcium-Aluminum-rich Inclusions in Chondritic Meteorites (G.J. MacPherson). Nebular versus Parent-body Processing (A.J. Brearley). Structural and Isotopic Analysis of Organic Matter in Carbonaceous Chondrites (I. Gilmour). Iron and Stony-iron Meteorites (H. Haack, T.J. McCoy). Cosmic-ray Exposure Ages of Meteorites (G.F. Herzog). Condensation and Evaporation of Solar System Materials (A.M. Davis, F.M. Richter). Early Solar System Chronology (K.D. McKeegan, A.M. Davis). Mercury (G.J. Taylor, E.R.D. Scott). The Origin and Earliest History of the Earth (A.N. Halliday). Major Satellites of the Giant Planets (T.V. Johnson). Interplanetary Dust Particles (J.P. Bradley). Subject Index.